The exhibition concentrates on an important series of the artists called "Spiritistische Sequenzen", 1974 - 1989, which investigates the representation of the supernatural in photography where "everyday objects seem to be endowed with supernatural powers. A table begins to turn, the dresser falls over, plates start flying, a vase begins to levitate slowly, bodies start to contort" (Clément Chéroux on Anna et Bernhard Blume, La photographie transcendantale at Centre Pompidou, Paris). 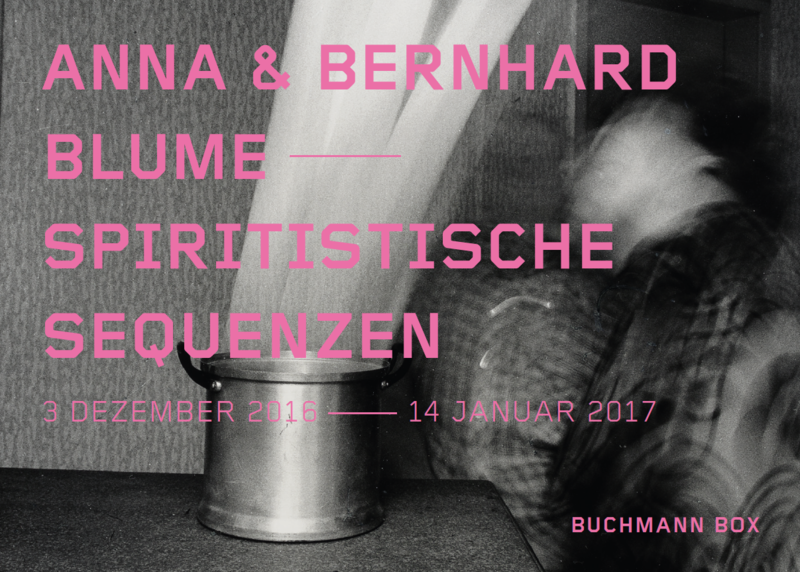 Anna & Bernhard Blume where working as a collaborative couple since the mid 1970's. Anna Blume was born 1937 in Bork, North-Rhine/Westfalia, Germany and lives and works in Cologne; Bernhard Blume was born 1937 in Dortmund, Germany, and died 2011 in Cologne. They studied together at the Staatlichen Kunstakademie Düsseldorf in the 1960s, but didn’t exhibit their joint work until 1977, at documenta VI (1977). Most recently their work was featured in a solo exhibition at the Pompidou. Other venues that have presented exhibitions dedicated to their work include Künstlerhaus, Stuttgart (1984), Kunsthalle Basel (1987), Museum of Modern Art, New York (1989), Wiener Secession, Vienna (1993), Milwaukee Art Museum (1996; exhibition travelled to Joslyn Art Museum, Nebraska and Busch-Reisinger Museum and Fogg Art Museum, Harvard University), among many others. In 2000 they were awarded the prestigious Berliner Kunstpreis. Buchmann Box, Charlottenstrasse 75, Berlin, Germany.